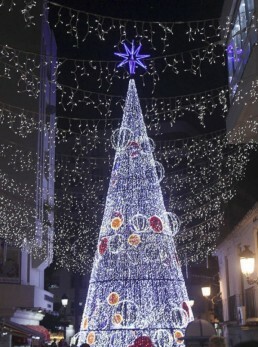 Marbella lights up tonight for Christmas! Marbella gets into the Festive spirit tonight with the official turning on of the Christmas lights. As well as the lighting up ceremony, there are also parades, musical numbers, concerts and children’s entertaiment planned for tonight. Marbella and San Pedro – the later with its giant Christmas Bauble that in bears an uncanny resemblence to the Death Star – as well as Las Chapas and Nueva Andalucia, all have activities tonight, Friday November 30. 19.00 Paseo de la Alameda: children’s entertainment and performance by singer Alejandra Gómez Ginger. 20.00 Paseo de la Alameda: Official turning on of the Christmas lights and a “musical spectacular to the rhythm of the Christmas lights”, followed by a performance by Raya Real.